Retail Resource is the industry leading provider of store fixtures, merchandising products and operational supplies for retail stores in the United States. Shop now! Keeping clothes neatly displayed can be a daunting task though it is something that must be kept up throughout the day. Customers come into the store, pick up a shirt from the neatly stacked pile, realize it’s not the right size and toss it onto the table just to pull out another causing the entire pile to fall over. Uggh, this is frustrating for the retail associate that just finished folding. Keeping clothes neatly displayed can be a daunting task. DON’T GIVE UP! An organized and clean sales floor helps your customers find what they need and ultimately make their purchase. There are tons of “how- to’s” when it comes to shirt folding on the internet. Chances are, associates don’t have the time to use these methods and can’t afford to take their attention away from customers to make sure every fold is precise. Here are several tips and tools to help keep folded garments nicely displayed. Folding Boards: One low cost, time saving solution is folding boards. There are several options to accommodate folding different shirt sizes. Clean folds can be made by laying your garment face down, placing the folding board on the garment, fold each side inward and then pull the bottom up to finish. Once folded, slip the board out and turn the garment over. A simple, perfect fold! A Flipfold is another popular model featuring a bottom and two side flaps that make folding shirts a snap. 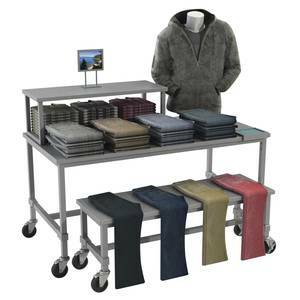 Mobile Folding Tables: Tabletop and Rolling Mobile Folds can be more costly but they are great time saving investments. These adjustable width folding stations allow you to fold several different sized shirts correctly with one unit. Side flaps help make folds crisp. 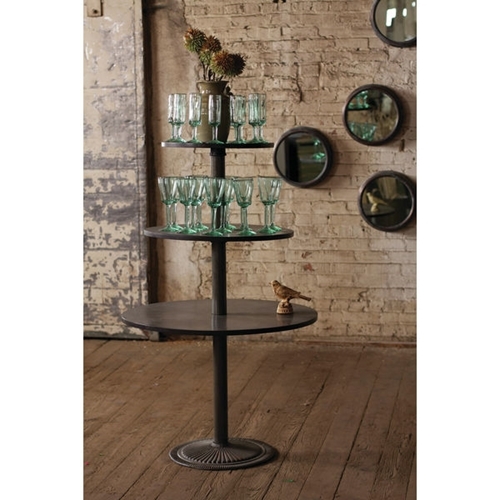 The table top unit can be used anywhere in the store. The rolling unit has an undershelf for supplies and can be easily transported. These are great for use in a fitting room area so you can fold the clothes as the customers exchange them for another size. Size Labels: Another simple, low cost solution is using size labels. Apply the stickers to the folds of the shirts so customers can easily scan the pile to find their size. When you can see the size on the edge, there is no need to rifle through every shirt to find your size. You can then stack shirts from smallest to largest, top to bottom, respectively. Choose displays that fit into your store’s budget. 4. 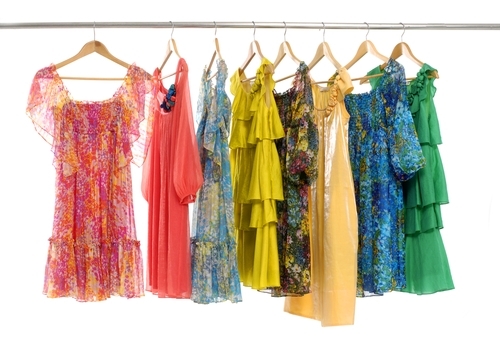 Display Choices: How you choose to display your apparel can make a huge difference. For example, display one single shirt on a torso form, apparel frame or shirt easel. Then, place the other colors and sizes neatly on the tables. When a customer can view the shirt, they do not have to handle it to see the design or fabric. 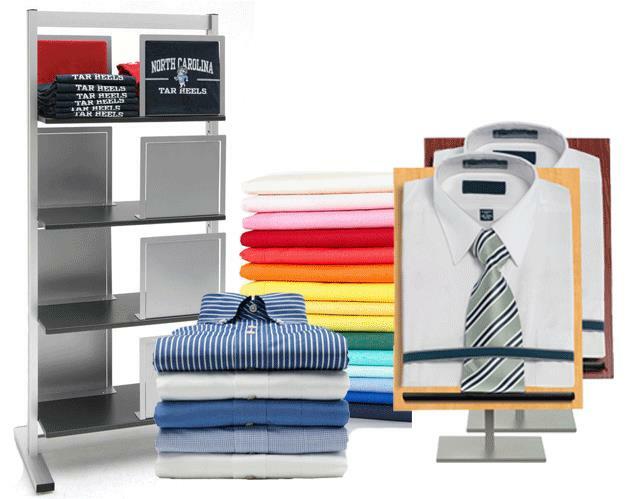 Make sure you choose the apparel display that fits the needs of the products in your store. Dress shirts will need a slightly more upscale display than a t-shirt. Choose displays that fit into your store’s budget but keep in mind the long term use of the investment. Remember, no matter how you decide to fold or display, stacks should be tidy, sized accordingly and color coordinated. These tips make the overall display attractive and easy to shop. 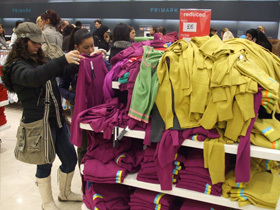 Retail Resource Blog © 2019. All Rights Reserved.